Simply Living: How many butterflies can you find? 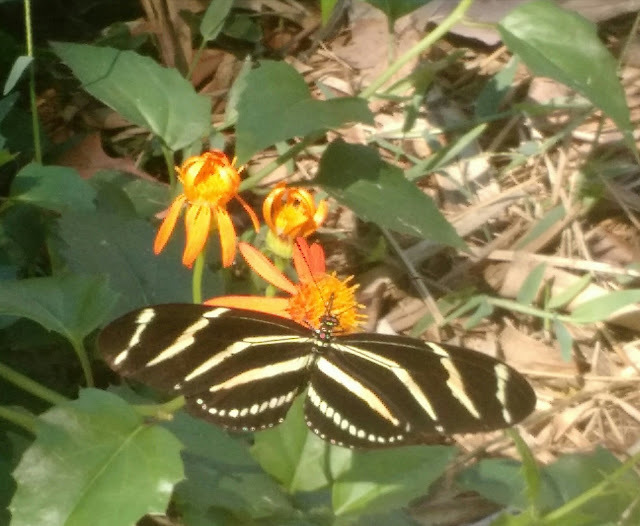 A young planting of Mexican Flamevine, Pseudogynoxys chenopodioides, has been attracting so many butterflies to our yard lately. The vine, in the same family as daisies, Asteraceae, is native to Mexico, Central America and the West Indies. My plant came from small cuttings my daughter and I snipped off about a year ago from a sprawling stand of Mexican Flamevine growing along Lake Minneola. Since my garden history includes many times when my love of vines has outweighed common sense, I was understandably conflicted about adding yet another potentially overly-aggressive plant to our landscape. I knew Mexican Flamevine would be an attractive addition to the yard if I could only figure out the right place to put it. I also knew that due to my lazy nature, no matter where it was planted, it would probably get out of control. Hmm...what to do? My 'must-have-another-vine' me was the winner. Unable to resist the incredible color of the plant's bright, daisy-like flowers, I took home a few cuttings, stuck them in some of Ralph's potting soil, placed them in a shady spot where they'd be watered regularly and then basically forgot about them. It turned out that one of my cuttings survived. Unfortunately, I didn't realize it at the time because I foolishly neglected to label it. (Remember what I said about me being lazy?) So a few months ago, when I decided to install a potted Beach Sunflower (Helianthus debilis) - another rooted cutting that was growing without a name tag - in the sandy soil next to our trampoline, I mistakenly planted my rooted cutting of Mexican Flamevine instead. By the time I realized my mistake, the Mexican Flamevine had begun to thrive. 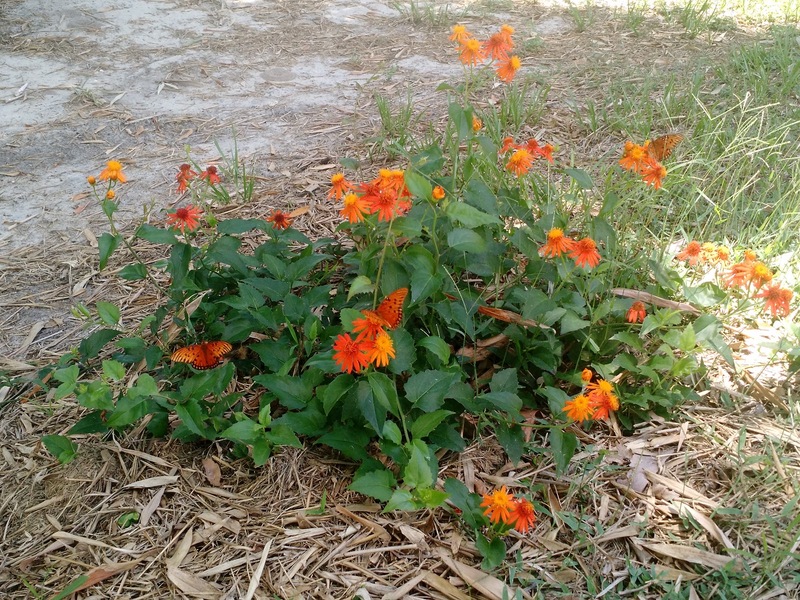 It had extended new stems and leaves and multiple flowers had begun to bloom. From the kitchen window, I look right at it. While washing dishes or working on the counter my eyes are constantly drawn to the brilliant orange blooms. Apparently, I'm not the only caught up in the plant's allure. Butterflies aplenty have been coming to visit! The Gulf Fritillary and Zebra Longwing have been the most frequent visitors so far but other flutterers, bees and pollinators check it out as well. 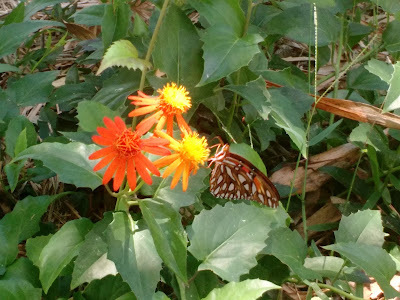 Here's a short video I made of several Gulf Fritillary butterflies fluttering around the bold blooms on a hot summer afternoon. I don't know yet where my Mexican Flamevine will end up, but I doubt if it will stay in the place where it's currently growing. I only hope that at some point I'll figure out an appropriate spot for it to go. Somewhere where it can thrive without growing out of control. Somewhere where I can see it often and enjoy the show. Somewhere that will make us all happy - plant, pollinators and lazy gardener me.